Innovative technology backed by extensive research is emerging in North America. 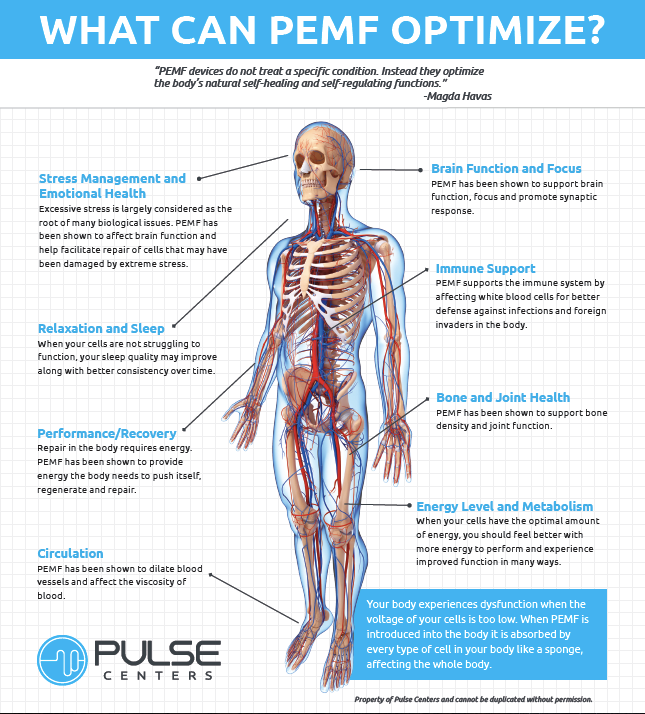 You may not yet be familiar with Pulsed Electromagnetic Field (PEMF) therapy or exercise, but it is widely used in Eastern Europe as standard therapy and adds a new, exciting dimension to biology and medicine. Used most commonly in the field of orthopedics, PEMF is a reparative technique for treatment of non-union fractures from sports or accident related injuries. Athletes in the NFL, major league baseball players, boxers and folks like you and me are finding extraordinary success with this therapy. More than a quarter million patients with severe ununited fractures have benefited worldwide from this surgically non-invasive treatment, without risk, discomfort, or the high costs of operative repair. Researchers have discovered that when there is an injury and tissues are stressed, the body creates a low power electrical signal. They believe this excites the body's natural mechanism to repair damaged tissue. Many factors can disrupt these signals causing pain, inflammation and loss of function. PEMF therapy mimics these natural signals and activates the normal healing process stimulating growth and repair of tissue. Cellular magnetic therapy and/or exercise use electrical energy to direct a series of magnetic pulses through injured tissue and bone. Each magnetic pulse induces an electrical signal that stimulates cellular rehabilitation and exercise. When a pulsing magnetic field penetrates into a bone, the pulsing magnetic effects cause tiny mechanical movements. This creates small electrical currents inside the bones and cells. In 1956 two Japanese scientists discovered the so called piezo-electric effect of bones. By measuring the voltage between two electrodes attached over a mechanically bent bone, they proved that electrical properties exist inside bones. Dr. Martin Milner, ND, professor of cardiovascular and pulmonary medicine, and CEO/medical director of the Center for Natural Medicine Inc. in Portland, Oregon explains it this way: "PEMF takes alternating current (AC) and transforms it into DC, producing variations ranging from low to high voltage. This voltage is passed through a coil generating a safe, pulsed magnetic field around the coil." As the magnetic field is pulsed on, cells are exercised. In the off phase of the pulse, the cells relax. "As cells expand and relax, they rehabilitate." Over 5,000 studies have been published worldwide over the last 40 years demonstrating PEMF therapy's effectiveness healing "soft-tissue wounds; suppressing inflammatory responses at the cell membrane level to alleviate pain, and increasing range of motion. The value of PEMF therapy has been shown to cover a wide range of conditions, with well documented trials carried out by hospitals, rheumatologists and physiotherapists." Kevin Greenspan, DC, in Black Mountain, North Carolina says that his patients using PEMF therapy report relief from arthritis, fibromyalgia, Parkinson's, migraines, depression and sinusitis. He agrees with Dr. Andy Bassett, MD that "This idea of manipulating cellular activity with magnetically induced electrical currents is looking like one of the hottest new fields." Scientific review in university laboratories and medical schools, along with numerous PEMF technology studies reported in medical journals, substantiates what enlightened patients already know. Because demand is growing for this new healing technique, those of us in the field of health are encouraged that people are finding help harnessing the body's own ability to heal. What is Happening and why can't I stop? The design of the brain is really interesting. Imagine or visualize that from the time a child is growing in the womb, the brain is like a rose bud. It has all the essential parts needed to form a beautiful flower once it has fully matured. But what happens to bud that becomes influenced by outside forces? ​ Early childhood trauma is interesting because the part of the brain that can tell the difference between what is a real danger vs. an imagined danger, has not yet fully developed. In essence the child has to rely upon the parents to continue to keep them safe until part of the brain that can (for instance) recognize the danger of crossing the street and look both ways is developed. Also the ability for communication and have an understanding of time is a part of brain development. During this time frame, any perceived threat or trauma incident is only recognized by ways of emotional and physical memory. This is called implicit memory, then implicit memory becomes procedural memory but it exists without a date or time stamp, leaving the procedural memory to exist as a continuing threat that can occur at any moment. This continued stress effects the brains development. In brief summary, it is under times of stress/trauma the sympathetic side of the limbic system activates and the nonessential systems for survival are shut down. This includes the frontal cortex where all reasoning takes place. Chances are in this heightened level of anxiety/stress that the frontal cortex is not operational or is extremely limited. Individuals with chronic stress issues may also have memory problems and potentially reoccurring nightmare issues when this activation is stuck. Cortisol used by the body for fight or flight is left trickling inside depleting the reservoirs and the body becomes more susceptible to pain. ​ On the other side what is interesting is a person can also be on the withdrawn and seemingly depressed spectrum which still ties into the parasympathetic side of the limbic system. According to Dr. Janina Fischer, some people may be misdiagnosed with ADD/ADHD, Borderline Personality Disorder or even with a Bi-polar disorder when they may actually be dealing with bad procedural memory programming relating to early childhood traumatic issues. By helping individuals learn how to use relaxation techniques and self-hypnosis to control what I call the throttle of the brain, they can become more regulated, and present in their right mind. I like to call it, "Learning to be still and know that He is God." What is interesting is even now, by using God's Healing Process many people have only begun to experience what normal feels like. I am grateful to God and give Him the glory for the work He has done. I have had individuals that have begun a transformational journey, being enabled to grow beyond the previous conditions that have kept them captive. Others have progressed in overcoming addictions that had been associated with historic issues. I will boast in the Lord and the good works that He accomplishes. Psa 139:14 (ESV) I praise you, for I am fearfully and wonderfully made. Wonderful are your works; my soul knows it very well. Dr. David I Copeland, PhD Graduate from International Institute of Christian Counseling and MA from Liberty University with focus on Marriage and Family Therapy. He has recognized the issues of trauma and PTSD and the secondary affects made within the family's system. He now specializes in working with individuals having challenges due to historic trauma and educating families to what is happening from within.